says a joint UNEP-Interpol report. By News Desk | Nairobi, Kenya: According to a joint UNEP-Interpol report, the value of environmental crime is 26 per cent larger than previous estimates, at $91-258 billion today compared to $70-213 billion in 2014. The Rise of Environmental Crime, released on the eve of World Environment Day, finds that weak laws and poorly funded security forces are enabling international criminal networks and armed rebels to profit from a trade that fuels conflicts, devastates ecosystems and is threatening species with extinction. UNEP Executive Director Achim Steiner said, "Interpol and UNEP have joined forces to bring to the attention of the world the sheer scale of environmental crime. The vast sums of money generated from these crimes keep sophisticated international criminal gangs in business, and fuel insecurity around the world. "The result is not only devastating to the environment and local economies, but to all those who are menaced by these criminal enterprises. The world needs to come together now to take strong national and international action to bring environmental crime to an end." Environmental crime dwarfs the illegal trade in small arms, which is valued at about $3 billion. It is the world's fourth-largest criminal enterprise after drug smuggling, counterfeiting and human trafficking. The amount of money lost due to environmental crime is 10,000 times greater than the amount of money spent by international agencies on combating it - just $20-30 million. "Environmental crime is growing at an alarming pace. The complexity of this type of criminality requires a multi-sector response underpinned by collaboration across borders. Through its global policing capabilities, Interpol is resolutely committed to working with its member countries to combat the organized crime networks active in environmental crime," said Interpol Secretary General Jürgen Stock. 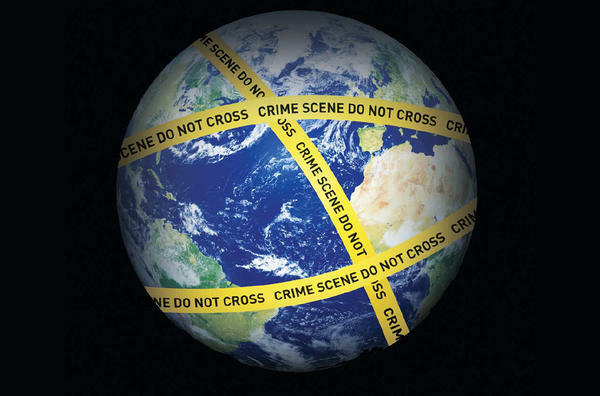 The last decade has seen environmental crime rise by at least 5-7 per cent per year. This means that environmental crime - which includes the illegal trade in wildlife, corporate crime in the forestry sector, the illegal exploitation and sale of gold and other minerals, illegal fisheries, the trafficking of hazardous waste and carbon credit fraud - is growing two to three times faster than global GDP. Already, thousands of people and more than 25 ministers have chosen a species to show their commitment to protecting wildlife. The host of this year's World Environment Day, Angola, has joined the fight, promising to shut down its domestic trade in illegal ivory, toughen border controls and restore its elephant population through conservation measures. More than one quarter of the world's elephant population has been killed in a decade. Some of world's most vulnerable wildlife, like rhinos and elephants, are being killed at a rate that has grown by more than 25 per cent every year in the last decade. The report also looks at how money generated from the illegal exploitation of natural resources funds rebel groups, terrorist networks and international criminal cartels. In the last decade, for example, poachers have killed an average of 3,000 elephants per year in Tanzania. That's an annual street market value for ivory traffickers of $10.5 million, an amount that is five times greater than the entire national budget of the country's wildlife division.